There’s a magical, time-travel quality associated with the concept of Dickensian-costumed singers that instantly puts people in a holiday mood and transports them to the 19th century. Yes, yes, we know it’s only October but it’s not too early to take note of – and start booking – some festive entertainment. Paula Walters and her husband, Johnny, are the founders/owners of The Victorian Carolers, a group that debuted eight years ago and has steadily built an impressive A-list of clients. Q: Let’s start with some background on the inspiration that launched The Victorian Carolers. A: Our desire to start the group actually came out of a need to bring in some extra income. Johnny and I were working on becoming debt-free, so we were taking the Dave Ramsey “Financial Peace” 13-week course at the time, and Ramsey suggests that you find something that you love to do and start a side business with it. Starting a Dickens-style caroling group immediately came to mind. We approached some of Johnny’s siblings with the idea, and they were willing to do it. However, we had no costumes or gig opportunities at the time. 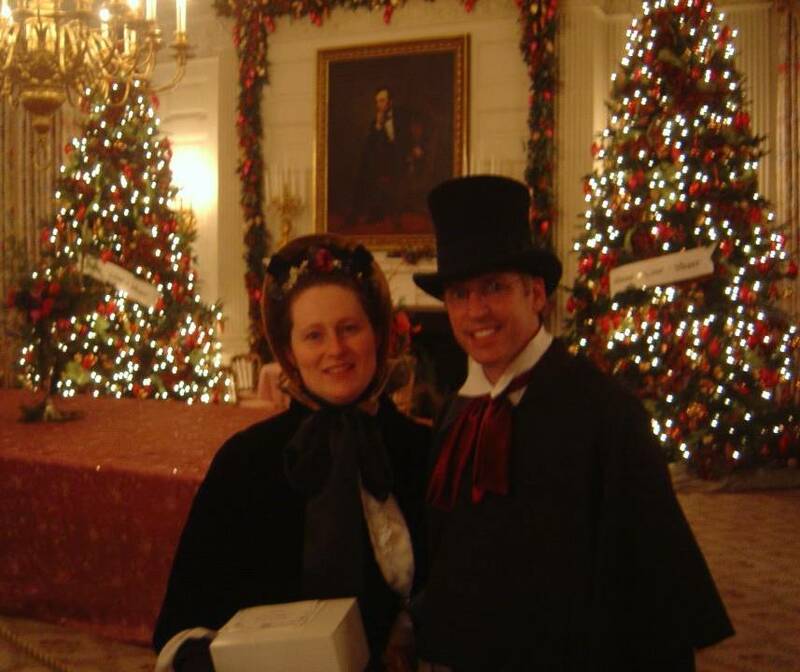 This was about four weeks before the start of the caroling season in 2005. Then another member of his family got a lead on someone wanting carolers for a Christmas event, so within two weeks we pulled together some costumes (Johnny’s mom is a seamstress) and some rehearsals… and it was a success! There were five of us in that first season, and we had about four gigs total that year. Things have really changed since then! In the coming years we auditioned new members of the group, and through the years his family has had to step back due to relocating, new jobs and other commitments. So it is no longer a family group, but rather a husband and wife team with six other really dedicated and talented musicians. We typically average about 30 gigs a season now. In addition to performing with the group, I am also its director. Johnny sings with the group as a tenor, and he also does all the British accents when we pull out any Charles Dickens quotes! Q: What’s your own training/background as a singer and a production director? A: I have a bachelor of music degree in vocal performance. The training, musical instruction and performance opportunities associated with that degree are what have definitely helped me as a director and singer. Above all else, this is what I love to do! As the oldest of five children, I was always staging “productions” with my siblings when we were kids. Whether it was putting on a play for my parents or directing short movie projects with our old video camera, I loved directing the show! Q: Did you audition singers for the group or were these friends and associates whose musical talents you were already familiar with? A: Our group is a mix of a little of both. Originally this was a family affair, but as the group changed and our need for more singers grew, we began to recruit some talented friends to join us. All of Johnny’s siblings have since left the group, and now we hire new singers through an audition process. There are eight members total in the group, including my husband and myself. We have two on each part: soprano, alto, tenor and bass. The sopranos are Laura Cashwell and Kari Amy. The altos are myself and Jody Rollins. Tenors are Johnny Walters and Rich King. The bass are Matt Lewis and Brian Ferguson. Our singers represent a wide variety of other occupations as well. Some are in the field of education, one owns an antique store, one administers the NC Bar Exam…these are an example of a few, but we are quite a versatile and active group of singers! Q: What attracted them to the concept of a Victorian holiday a cappella group? Laura Cashwell states, “What attracted me to the idea of the group is that I love to sing, missed singing and wanted to get back into singing with folks who love it and were passionate about it — also similar to acting in plays sometimes!” To be able to sing together, dress up in costume, and bring happiness to others is an amazing way to spend the evening. Q: How did you initially go about spreading the word that your group was available for performances? A: Initially, before we had a web site, we used word of mouth and phone calls to advertise. Eventually we got a business card, and then a website. What I didn’t know at the beginning is what types of people would be looking for our services. Now I have a good feel for our market. It is amazing how social media helps with advertising now, too. Also, a good website is definitely a must for any business to succeed in today’s market. Q: Who is your target demographic and what geographic area do you cover? A: I think that all ages and many types of people enjoy our group. It’s hard to target a specific demographic. Many places, like shopping malls, hire us for children and adult shoppers alike. Obviously we target our advertising toward people and companies that can afford to hire us, but we also offer discounts to nonprofits, such as schools and churches. Geographically, we are based in Raleigh, North Carolina, and that is mostly where we perform. However, we have also performed in Charleston, SC , Williamsburg, VA and Washington DC. We have also performed in other parts of NC, too. Q: When and where did the group make its official debut? A: Our first official gig was at a community Christmas event in a nearby subdivision. They had hired a horse-drawn “sleigh” and had hot chocolate, coffee and desserts. It was bitterly cold that night, but we really enjoyed being the featured entertainment. One of the best memories that season was just discovering how much people enjoyed the sound of carolers and a cappella music. It is so nice to see people’s faces light up in delight when they hear and see you! Q: How much time is spent in selecting the songs and rehearsing them? A: We have a running repertoire of over 50 songs that we rehearse and build on each season. Our goal is to eventually reach 100. We spend about 20+ hours in rehearsals together each season. That does not include the time we spend individually on music, or the time we spend recording demos, etc. Q: Tell us about those fabulous costumes! A: We have spent countless hours and dollars on our costumes, and most of the pieces are custom designed for each individual singer. We work with a milliner who specializes in period hats, and she helped us design and sew our own Dickens-style bonnets. Each season we pick one aspect of the wardrobe to improve upon. Since it is really expensive to assemble a unique and historically accurate costume, we do it little by little. In this way each season we get a new and improved look that is even better than the season before! Q: London in the mid-19th century wasn’t a particularly pleasant place to be (especially if you were an orphan) and yet there’s something about the imagery of the period that imbues people with warm and fuzzy feelings of nostalgia, family and holiday traditions. Why do you suppose that is? A: Two words: Charles Dickens. It was his A Christmas Carol that brought about a major shift in how Christmas was celebrated and, of course, that was during the Victorian era. Combine that with the marriage of Queen Victoria to Prince Albert of Germany. The Queen brought all of the wonderful German traditions, such as a Christmas tree, to the attention of the London masses. Hence, traditions were started, carols were revived, and new ones were written about all of the wonderful joys of Christmas. It is easy to see how Victorian carolers would embody all of those lovely images of Christmases past to so many. We provide people the opportunity to stop for a second during the rush of the season and reflect on a special song or memory. That is priceless. Q: What’s your favorite classic Christmas carol? And what’s your favorite modern carol? A: Kari Amy says: “My favorite classic carol is, and has always been, What Child is This. I specifically enjoy the Cambridge Singers rendition. My favorite modern Christmas song is probably A Baby Changes Everything by Faith Hill.” Laura Cashwell loves O Holy Night, with I’ll Be Home For Christmas as a favorite modern classic. Jody Rollins says that O Come All Ye Faithful is her favorite, with Breath of Heaven being her favorite modern Christmas song. Johnny Walters loves Ding, Dong Merrily On High. That is probably one of my favorites as well. Silent Night, especially when sung in German, is also at the top of my list. Q: You recently sang at the White House. What was that like? A: It was so much fun! It was like being a kid again. To do what you love to do in such a lovely, historic home and national monument is wonderful…there is so much history there! And suddenly, you realize that you have become a small part of that history by sharing your talents and music with those around you. It was exciting to go behind the scenes and see a different side of the White House. We also didn’t know what to expect, who we would be singing for, etc., so it was exciting to see how the evening would unfold. Q: What’s the funniest, most nostalgic or weirdest thing that has ever occurred in conjunction with a scheduled performance? A: We have had many nostalgic moments together, like when snow started falling as we were singing on a quaint street corner. (Snow is not very common here in NC, especially before Christmas.) We have lots of memories from when we sang for Disney on location for their movie premieres for Disney’s A Christmas Carol in NC and Charleston, SC. And once when we were performing at the airport, Tony Butola of the Lettermen came up to us and introduced himself. Several years later we had the privilege of entertaining the guests before one of his Lettermen Christmas shows. It was fun to meet him again. And, of course, there is the White House (pictured at the top of this article). Perhaps most touching of all though is when we sang for a “special needs” group of kids and adults at our church. As we sang the words to Away In a Manger, the truth and simplicity of one of the verses hit us all in one powerful moment: “Be near me Lord Jesus I ask you to stay, close by me forever and love me always. Bless all the dear children in thy tender care, and fit us for heaven to live with Thee there.” We all started crying and could hardly finish the song. The words of the carol came to life as we looked into the faces of these precious children- one of them was our autistic daughter – how God dearly loves them and has them in His care. This last verse is just a simple child’s prayer, as if spoken by the hearts of one of these children. Perhaps these children could better understand the gift of the Savior and the reason for Christmas more than anyone. And even though society may cast them aside because they are different, God loves them, and He “fit” them to be exactly who they are for a reason. A: Another reason that I love singing with the group is that I get to sing about Jesus, my Saviour. We are a faith-based group, and we know that God has led us each step of the way and blessed our hard work and efforts. It is wonderful to sing about His birth, the story of His life, and about why He was born. Yes, the other songs are fun, like our du-wop version of Rockin’ Around the Christmas Tree, but the real meaning of Christmas goes beyond our traditions and most cherished memories….it goes back to the birth of Jesus over 2,000 years ago. And that moment has impacted the rest of time as we know it in a most profound way. What a joy to be able to sing that all over town! To learn more, readers are invited to visit www.raleighcarolers.com or contact Paula for booking information at info@raleighcarolers.com. What a great interview and great story you guys have! Paula, im so proud of you and happy to see how you’re using your amazing talents!!! Keep it up and I wish you much success! !